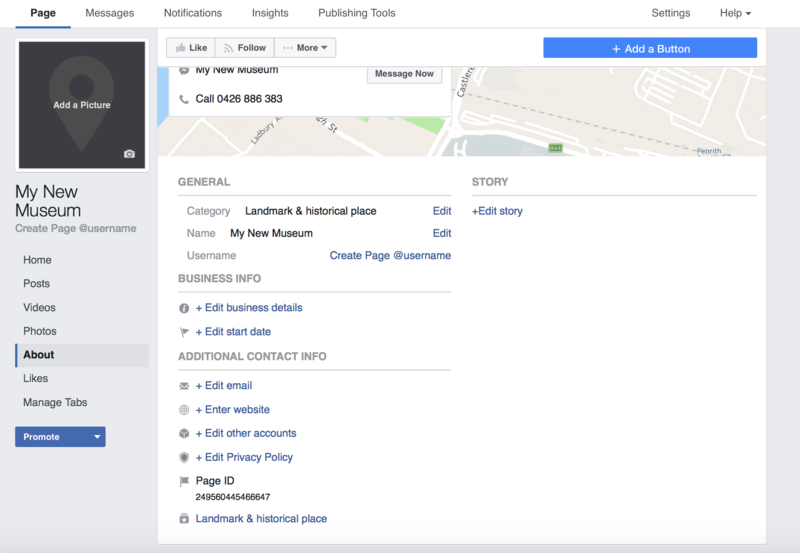 Facebook allows you to connect directly with your community and remind them of your presence and activities. When you post to your page it shows up in the news feed of your page ‘Likers’ whereby they are able to engage with your posts by clicking on your links or by sharing and liking your posts. By sharing your links, videos, pictures and events, your followers are providing you with valuable word-of-mouth advertising. In effect your followers can engage with your organisation, form deep connections, and become an audience of loyal visitors and followers. Social media motivates visitation, influences donations and encourages membership. Data is beginning to suggests that social media is fast becoming a more important source of visitor planning and information than many organisations websites. Don’t make the mistake of treating your Facebook page like an advertising channel, which has the proven effect of causing followers to tune out from the message being provided. 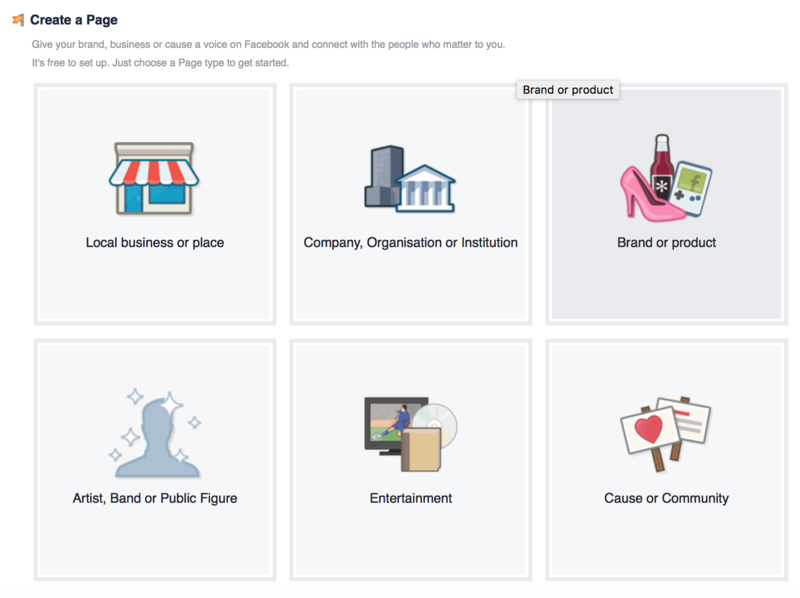 Ensure your Facebook page celebrates your community and industry, not just your own news and accomplishments. Create posts that speak to your audience in a conversational voice. It is important not to treat social media as a communication add-on but as an essential opportunity for connection with your community. 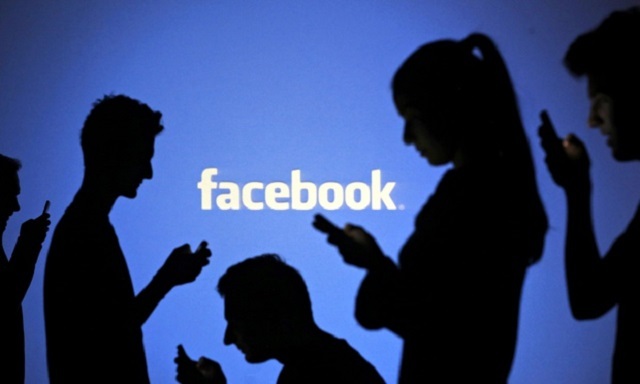 You will need to have a personal facebook account to set up a page for your organisation. Select the most appropriate option and fill in the contact details for your organisation. We have created a fictional museum in the example below. 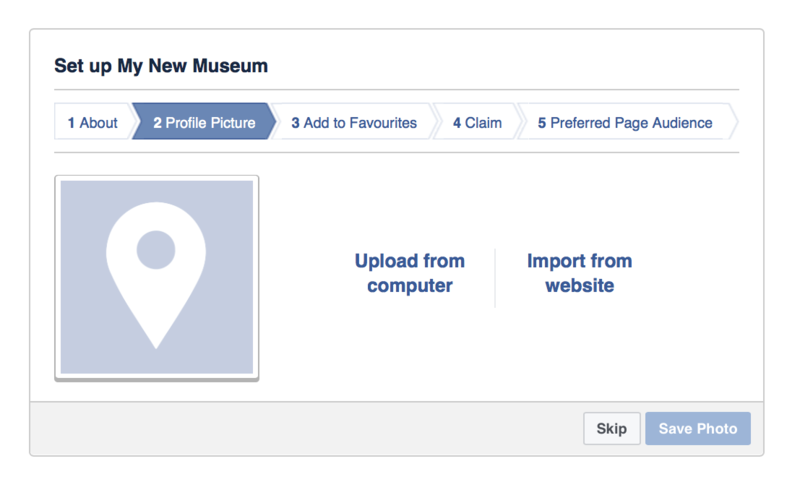 Fill in details of your website (if you have one) and select a custom username for your facebook page. This will also help people search for your page so it is best to keep it simple and specific to your organisation. Upload a profile picture. You can drag and drop from your computer straight into facebook. Choose something interesting that reflects your organisation, pictures with people in them are great. Try and change your profile picture regularly, it will make your page more interesting and will show up in your followers newsfeed. 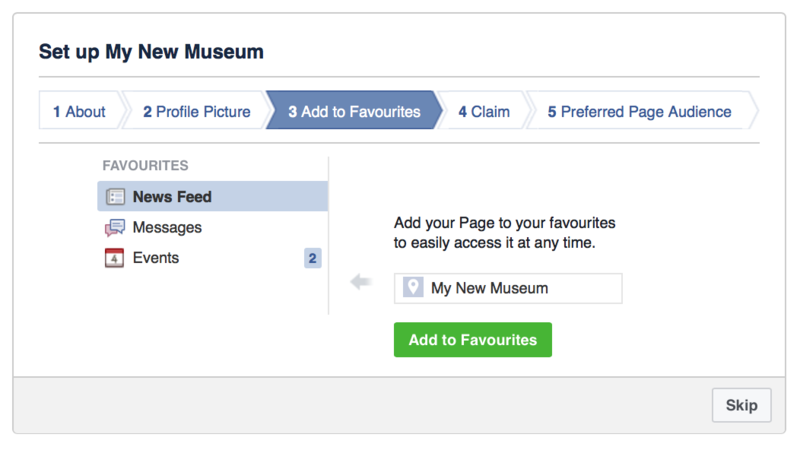 You can add your page into the favourites tab in your personal facebook account. 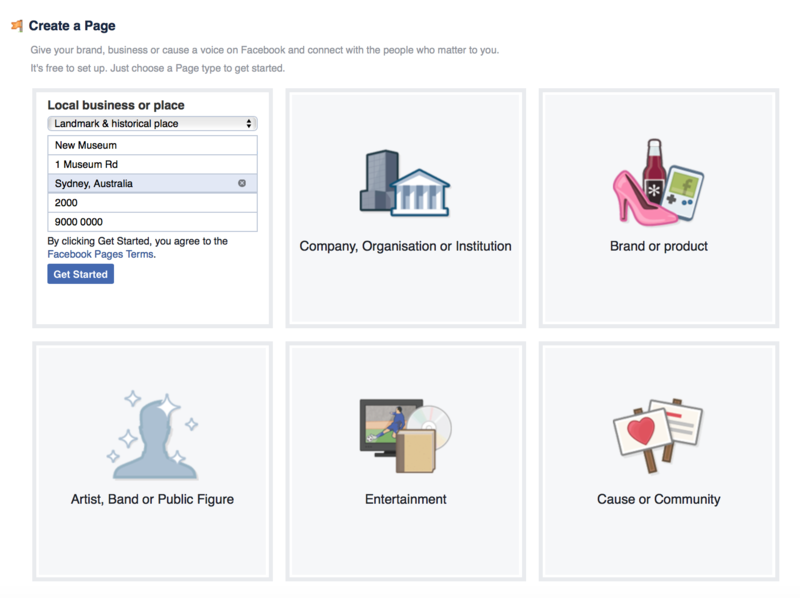 This makes it easy for you to find your page and make changes. It does not affect how your followers will see your page. 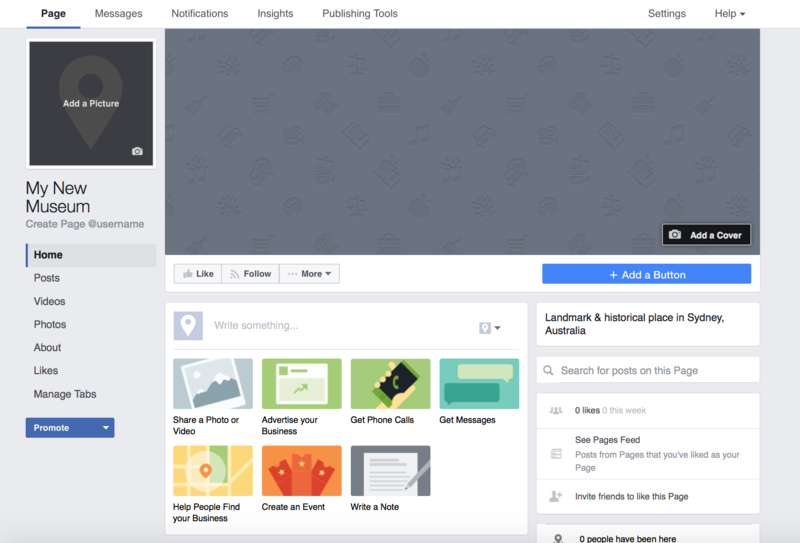 Facebook tries to verify pages to ensure that the person who administers the page is authorised to do so. It may suggest similar pages that could be duplicates of your organisation. If you find that there is already a page dedicated to your organisation you may be to “claim” it and take control of its content. If there are no pages you would like to claim you may skip this step. 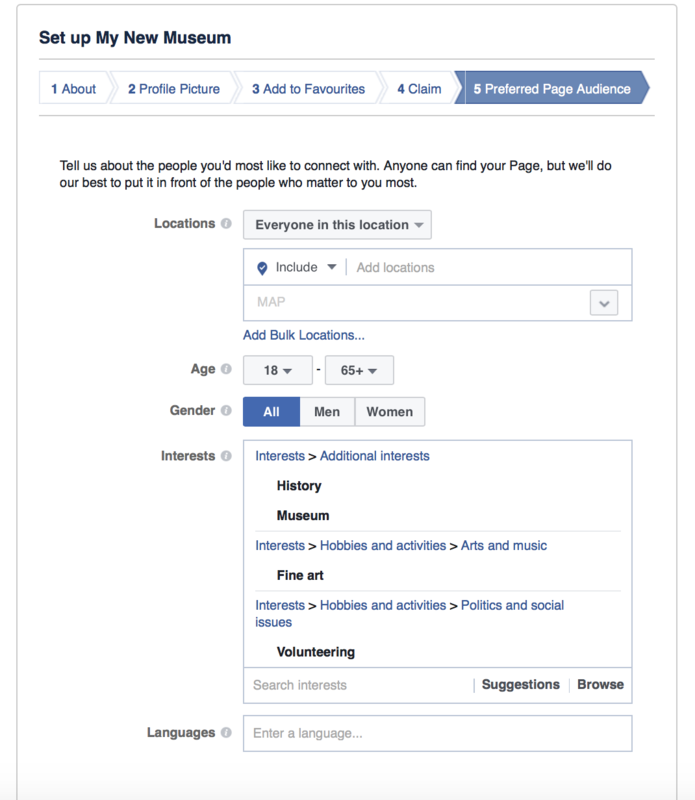 You can specify target audiences for your page. This helps facebook advertise your page to potential followers. 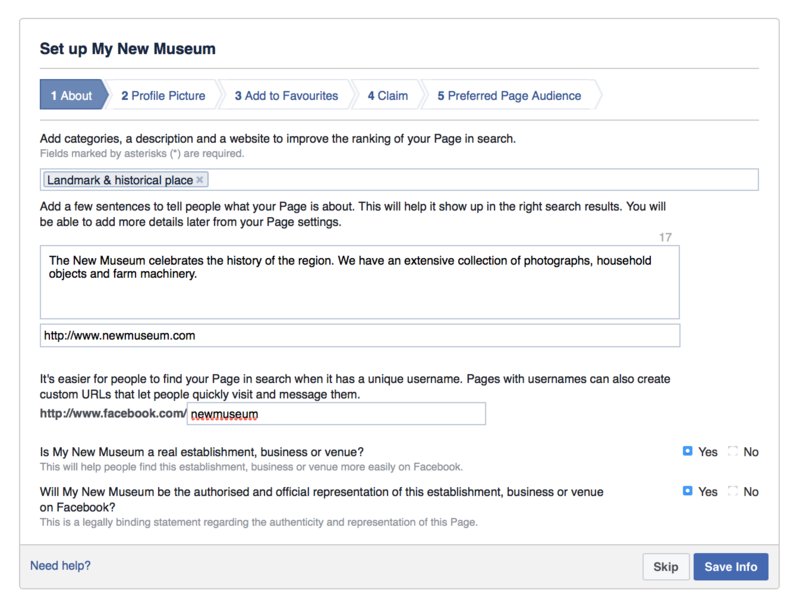 You can add key words such as history and museum below or search facebooks categories for appropriate segments such as fine art and volunteering below. Your page is now ready to go. You can add a timeline photo which will display at the top of your page in addition to your profile picture. Selecting About on the side menu will allow you to edit the details of your page. You can additional contact info, a “story” which sholud be a paragraph about your organisation and hat you do. Try searching and looking at some other pages to see what they are doing that may be applicable to you. Invite members of your local community to follow your page and engage with your content.